Yes, it was just this awkward. Middle school, and high school band for that matter, was exactly this awkward. There were good times for sure, but nothing that wasn’t painful on many levels. 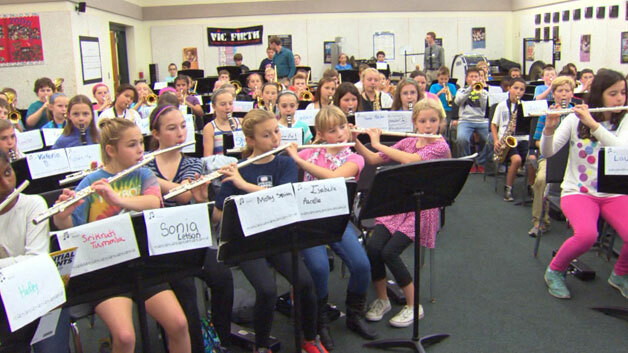 My middle school years were taken up with 6th grade and then 7-8th grand band classes. Mr. Kirby, our conductor, was fabulous. What my elementary school band teacher, Ms. Upton, taught me was enhanced and expanded greatly. I remember the passion and drive of our conductor especially. Specifically, I remember how he used to remove the rubber grip from his baton repeatedly during classes. He would flip the baton around, conducting with the tip as the rubber grip waved in the air. The day that this backfired on him and the grip flung behind him and slapped the chalk board hard, was especially humorous to all of us band-geeks in attendance. Concert band was fun, but marching band was just beginning to rub me the wrong way. I remember the awful faux silk uniform tops with black pants bottoms, the long bus rides to parades and the repetitive and uninspiring music that planted the seed for my hatred of marching. Walking in straight lines while playing music isn’t a skill that I think needs to be encouraged. In fact, I would prefer that music be focused on itself and not the multitasking that we subject it to while marching in step. Maybe that’s just my own personal bias, which we’ll get to when it comes to my college girlfriend and drill instructor, but I’m getting ahead of myself here. For all that, middle school band was fantastic… when compared to high school. I remember starting out my freshman year in marching band. Wow, did I ever hate that, and it did not lessen as the years went by. No, it was not assisted by the band director leaving our first week of camp to be the band director and assistant principal of the rival middle school from which I had just been released. I understood why he had made the change, it just frustrated me. Thankfully, the new director was someone I respected and thought the world of. Too bad he didn’t last a year. Mr. Crowe was great. He was young, energetic, understood what a high school band needed to be successful and was highly skilled at his job. Unfortunately for him, he faced budget problems, declining participation and a band director from our county rival whose tenure was threatened. At mid-year, he was put on notice that if the county rival couldn’t find another job, his job would be eliminated and she would take his job. Those of us in band realized how awful the rival band was, much of which was directly attributable to the conductor, and wanted nothing to do with her. Thankfully, that rival conductor was able to finish a masters degree in foreign language and stayed at her school. Unfortunately, our beloved brand new director left for greener pastures. We couldn’t blame him, but frustrating it was to get director #3 in 2 years. Mr. Ballard was even better. He knew jazz and despite my continued infliction of marching band, I graduated to second chair tenor sax in the jazz band. Ballard was amazing and I couldn’t have asked for a better introduction to my favorite style of music. The man was incredible. Where Crowe had been a wizard with concert band, Ballard had been the same with jazz. But failure struck again… Ballard and his wife divorced and he moved away after just one year. This is when *she* came in. Truthfully, I can’t remember her name. Really, I can’t. She was just that bad. After my junior year with her in jazz band (I had successfully avoided marching band with her), I was done. She forced the entire jazz band to do double-duty as the pep band; a role I hated nearly as much as marching. Sports are anathema to me, so to spend my evenings and weekends supporting that anathema was misery. After my junior year, I ditched band entirely for a double-ration of choir. I had joined choir my sophomore year and our conductor there was incredible. Ms. Fleitz was awesome and everything my band instructors were not. Well trained, motivated and able to bring out the best in all of us, she was everything I wanted to be in a musician. I cannot say enough great things of her. I remember that junior year band instructor, one day on hall duty, telling me that if I didn’t hurry up I would be late to class. I intentionally slowed down so that I made it into choir class, the room right next to the band room, only a second before the clock dinged. I stuck my head back into the hallway just to make sure she realized I made it before the clock struck. Yes, I was a jerk. I have (mostly) remedied this failure of my personality. It was that last year of high school, with all that vocal expression, that convinced me that a vocal major was the right thing for me in college. I should have known better. Despite being one of the premier talents in the class, I wasn’t really that great and our conductor, despite being very gracious, tried to signal that to me. It was a lesson that I didn’t learn at the time and would come back to haunt me only two years in the future.